In 2015 Carl Nielsen will be celebrated in Denmark and abroad with concerts, competitions, exhibitions, lectures, CD and book releases, and much, much more. To give you a quick overview, this page allows organizers of some of the largest events to describe the experiences awaiting us. The Royal Danish Theatre has a very special bond with Carl Nielsen, which to us makes the celebration of the 150th anniversary of his birth more than just the celebration of the greatest Danish composer of all time: For almost a quarter of a century Carl Nielsen walked the halls of the Royal Danish Theater as musician and later conductor in the Royal Danish Orchestra. Furthermore, Carl Nielsen wrote both his six famous symphonies as well as his two landmark operas specifically to be world premiered at the Royal Danish Theatre with the Royal Danish Orchestra at the helm. To sum up: With Carl Nielsen being Denmark’s foremost composer and The Royal Danish Theatre being one of Denmark’s foremost cultural institutions – if we were not to celebrate Carl Nielsen, who then would? Our choice to contribute to the Carl Nielsen celebrations with the composer’s two operatic works, Maskarade and Saul and David as well as his 5th Symphony is partly due to the historical connection between the three works and the theatre and partly founded in our ever present wish to offer our audience the opportunities to become acquainted with the best of the operatic and symphonic repertoire. Both of Carl Nielsen’s operatic works hold a claim to being among the foremost Danish operatic works ever created: Saul and David was Carl Nielsen’s biggest work and it is also one of the most influential pieces in the history of Danish music. In this opera we feel the inspirational ties to the grandiosity of Richard Wagner, mixed with Carl Nielsen’s ability to cut his music to the bone and let the music tell a realistic and unsentimental depiction of life and death as it has played itself out among us humans from the beginning of time. The opera is a demanding piece for singers, directors and musicians alike and is therefore not performed very often. But on the occasion of this great celebration of the composer The Royal Danish Theatre will naturally include this production in our repertoire. As obvious as it is for us to present Saul and David at the Carl Nielsen celebration, just as obvious it also is for us to present the composer’s second opera – the most performed Danish opera on the repertoire: Maskarade. In this comic opera, the sharp-witted comic talent of the Danish playwright Ludvig Holberg – the Danish Molière – is set to music by Carl Nielsen, thus showing to the world just how far his talents reached: From the great tragedies to the everyday comical. It would quite simply be impossible to celebrate Carl Nielsen without a production of Maskarade, and it is always a joy and a challenge for both our singers and our musicians when we do so. Throughout the history of Danish classical music there are few works which may compare to Carl Nielsen’s 5th Symphony. It is both highly original, unorthodox, awe inspiring, and uplifting. It is abstract yet perfectly clear for even the untrained classical ear to listen to and understand. This alone is reason enough to include it in our Carl Nielsen celebration. The spirit of Carl Nielsen’s life and work are inextricably linked to the history of The Danish Royal Theatre. With the presentation of his two operas and his 5th Symphony we wish to be a part of the continued focus on Carl Nielsen’s unique and invaluable contribution to the history of the opera and classical music in Denmark as well as around the world. His music simply cannot be kept under lock. Nielsen’s orchestral works are in popular demand in Danish concert halls, and performances abroad increase in ever growing numbers, most recently and notably with the New York Philharmonic. In 2015, Danish orchestras will unite and spotlight Nielsen’s music more than ever before. The positive interest in his work should perhaps not come as a surprise, considering the degree to which his music is permeated by a vibrant energy within the framework of an original and recognizable musical language. The Danish National Symphony Orchestra (DNSO) and the Aarhus Symphony Orchestra will perform all six symphonies in the course of 2014 and 2015. Earlier this year, the DNSO presented a number of sneak previews featuring prominent guest conductors such as Nielsen experts Herbert Blomstedt and Osmo Vänskä. The remaining symphonies will be conducted by Fabio Luisi, Vladimir Ashkenazy, Juanjo Mena and Michael Schønwandt. The Danish Broadcasting Corporation will record all of the symphonies as well as the three solo concertos for both radio, internet and TV. In January the DNSO will tour Germany and the US with the Fourth Symphony and the overture to Masquerade. The highlight of the tour will be a concert at Carnegie Hall, where American concertgoers will not only be able to look forward to a Danish interpretation of Carl Nielsen, but also the Sibelius violin concerto, played by none less than world-famous violinist Anne-Sophie Mutter. On 9 June 2015, the 150th anniversary of Nielsen’s birth, the composer will be celebrated at DR Koncerthuset, the Danish Broadcasting Corporation’s concert hall in DR Byen, with a gala concert featuring Nielsens works Hymnus Amoris, the Clarinet Concerto, and the Fourth Symphony. In August 2015, the DNSO under the leadership of Fabio Luisi will give a guest performance at the Proms in London. The programme will include Nielsen’s Symphony No. 2 and Hymnus Amoris. The Odense Symphony Orchestra will celebrate Carl Nielsen with a varied programme consisting of traditional concerts, a theatre concert with high-school students, an evening of conversation between folk musician Harald Haugaard and John Fellow, editor of the voluminous edition of Nielsen’s letters, Tip Toe Big Band, museum exhibitions, and much more. Conductor Michael Schønwandt, perhaps the most prominent Nielsen interpreter today, will lead the Copenhagen Phil in a performanc of the Second Symphony and Nielsen’s controversial organ work Commotio, previously re-composed and orchestrated in the style of Nielsen by Karl Aage Rasmussen and Bo Holten, respectively. One of Denmark’s foremost musical communicators, entertainer Sigurd Barrett, can be seen walking in Carl Nielsen’s footsteps on the silver screen at Musikhuset Aarhus, accompanied by Bjørn the Bear. The South Denmark Philharmonic (Sønderjyllands Symfoniorkester), joined by composer and conductor Bo Holten, will among other things present a musical rarity: Amor og digteren (Cupid and the Poet) – a short piece of theatre music about Hans Christian Andersen’s love for Jenny Lind – the cantata Fynsk spring (Springtime on Funen), and the picturesque concert overture Helios. Finally, none other than the Vienna Philharmonic will visit Aalborg, Odense and Copenhagen with the Fourth Symphony. Carl Nielsen is closely associated with Funen and Odense. During his childhood in Nr. Lyndelse his father introduced him to the traditional music. At the age of 15, he became a musician with the regimental band in Odense, before starting his training four years later at the Royal Danish Academy of Music in Copenhagen. Nielsen’s childhood and career is presented through the exhibitions in Nielsen’s Childhood Home and the Carl Nielsen Museum, both institutions within Odense City Museums. Odense Symphony Orchestra’s artistic profile has Carl Nielsen and his music as one of its main pillars, and is hosting one of the world’s leading music competitions Carl Nielsen International Competitions, which has formed the carrier for many gifted musicians, among others the international star violinist Nikolaj Znaider. A contemporary spokesman of Carl Nielsen, his songs and traditional music is the award-winning violinist, composer and bandleader Harald Haugaard, who resides at Funen. In 2015 Odense will provide a framework for a variety of concerts and other activities around Carl Nielsen and his music. The common denominator will be presenting Carl Nielsen as an artist of our time, arranged at eye level with the audience and telling that the story of our great composer has a relevant message to all of us. Many of the city’s cultural institutions, festivals, clubs, choirs, theaters and orchestras offers numerous events to the celebration: Odense Symphony Orchestra, Odense Music School, Tiptoe Big Band, The Exhibition Building Filosoffen, The Flower Festival, HC Andersen Festival and many more. Odense Symphony Orchestra presents a comprehensive Nielsen program in which orchestral music and chamber music is in focus. This includes a collaboration with Nikolaj Znaider and Harald Haugaard, both of which are appointed Carl Nielsen Artists 2015. At the same time, the orchestra is behind a number of innovative initiatives that aim to convey Nielsen to a larger audience. Discover for example: a Carl Nielsen Theatre Concert, explore Carl’s Neighborhood, participate in sing-along events or create your own choir concert with music recorded by the Symphony Orchestra. The highlight will be the birthday of Carl Nielsen on 9th June which is celebrated with a gala concert in Odense Concert Hall and singalong on Flakhaven. The following day Odense will for the first time host a concert by the Vienna Philharmonic. Odense City Museums celebrates Carl Nielsen with three book launches. In 2015, Odense City Museums will issue in total three books on Carl Nielsen. The first is a reissue of the composer’s childhood memoires Min fynske Barndom [My Funen Childhood]. Since they were issued for the first time in 1927, the memoires of childhood and youth on Funen have been recognized for their considerable literary qualities. Now these memoires are reissued in a critically revised edition with extensive comments and illustrations. The next launch will be an anthology based on Carl Nielsen’s attachment to Funen. The anthology can be read as an independent book – and as a framing story about the childhood memoires, and thus the two publications can supplement each other. Finally, we will issue a book on the basis of the Carl Nielsen Museum’s extensive collection of art. The Carl Nielsen Museum opened in 1988 thanks to a gift by will from the composer Carl Nielsen and the sculptor Anne Marie Carl-Nielsen’s youngest daughter. This new book focuses on some 200 paintings plus graphic works, sculptures and various other works of art made by artists among the Carl Nielsen-couple’s friends, and therefore the book widely elaborates the relation between them. The three books are issued by the Odense City Museum Publishers on Carl Nielsen’s birthday, June 9 2015. “Nielsen’s time has come.” That has been the clear message on several occasions from the New York Philharmonic’s music director Alan Gilbert, who with his love of Carl Nielsen’s music stands at the head of the biggest, most significant international Nielsen venture in connection with the anniversary year. As early as 2012 the New York Philharmonic, along with Dacapo Records, launched The Nielsen Project, a concert and recording series that is the famous orchestra’s first CD release for over ten years. With The Nielsen Project tens of thousands of New Yorkers – and even more Carl Nielsen listeners – have experienced Carl Nielsen’s symphonies and concerts live at the Lincoln Centre. The project has become a real milestone, first and foremost for the spread of Carl Nielsen’s music, but also for the development of the New York Philharmonic’s new artistic profile. From the outset the American press has acclaimed The Nielsen Project as an important new departure in the repertoire of the New York Philharmonic and Alan Gilbert. “It is heartening to see Mr. Gilbert turning one of his passions into a major statement,” wrote the New York Times in 2012, and in 2014 the New York Magazine noted that “the Philharmonic and its music director Alan Gilbert have turned themselves into a force of permanent revolution.” At the same time there is an important historic dimension to The Nielsen Project, both for the New York Philharmonic itself and for the orchestra’s audiences, since the orchestra’s first Nielsen adventure in the 1960s under the iconic conductor Leonard Bernstein remains strong in many people’s memories. As the first official event in Carl Nielsen’s 150th anniversary year, on 7 January 2015 the New York Philharmonic, Dacapo Records and the Danish Consulate-General invite the public to an “Insight event” with Nielsen in focus. This event marks both the completion of The Nielsen Project as a concert series and the beginning of the international celebration of the Nielsen year. It presents the high points of the international Nielsen celebrations for the first time together, at the same time leading up to the last recording in The Nielsen Project with the debut of the New York Philharmonic’s solo clarinettist Anthony McGill in focus. So although The Nielsen Project reaches its goal in the first weeks of the anniversary year, Carl Nielsen will be celebrated in New York again around his birthday on 9 June 2015, when the New York Philharmonic, Dacapo Records and the Danish Consulate-General invite the public to a major, live musical tribute on Carl Nielsen’s 150th anniversary, which will also be the (re-)release date for the Nielsen Project recordings in a special anniversary box of all four CDs. The exposure of Carl Nielsen’s music in New York has become a unique cultural exchange between Denmark and the USA, which also includes the Danish National Symphony Orchestra’s visit to Carnegie Hall in February, and which has given our national composer a coverage that no one would have dared dream of beforehand. We look forward to completing The Nielsen Project and raising Nielsen’s music to new heights in 2015! The Carl Nielsen International Chamber Music Competition for String Quartets and Wind Quintets 2015 is arranged in cooperation between the Danish Broadcasting Corporation, The Royal Library and The Royal Danish Academy of Music. The focus of the competition is on Carl Nielsen’s chamber music, represented above all by the string quartets and the Wind Quintet, the latter having become a central part of the international core repertoire for woodwinds. Our aim is to celebrate Carl Nielsen by disseminating his chamber music to an even wider audience and inspire fresh interpretations of his quartets and the quintet, performed by the best young musicians from all over the world. The competition will be held in Copenhagen from 12 to 18 October 2015. The first rounds will take place at The Royal Danish Academy of Music, the second round in Queen’s Hall at The Royal Library, and the finals at DR Koncerthuset (the Danish Broadcasting Corporation’s concert hall in DR Byen). The competition is open to musicians under the age of 35, and the panel of judges consists of leading chamber musicians from around the world, chaired by conductor Michael Schønwandt. In addition to works by Carl Nielsen, the repertoire will include well-known standard works for string quartet and wind quintet. New works written especially for the competition will be performed by the ensembles in the second round. A number of cash prizes will be awarded, including two first prizes of EUR 15 000 each for the best string quartet and the best wind quintet. The competition will be broadcast and streamed live by the Danish Radio. Besides cash prizes, the winners will receive offers to perform at festivals and chamber music series. The Carl Nielsen Edition is a practical and scholarly edition of Nielsen’s oeuvre, comprising all his finished works in 39 volumes. The final volume of the edition was published in the spring of 2009 after c. 15 years’ work at The Royal Library in Copenhagen. The edition is aimed both at musicians and scholars, and its ambition is for the first time to present the works in the shape as Nielsen had intended, that is without the changes, cuts, mistakes and confusion which have appeared in some of the works during the years after they were written. More than one third of Nielsen’s collected works had never been printed prior to the edition and have thus never been through a thorough scholarly evaluation as to their sources and their dissemination. This applies to the two operas, many of the cantatas and much of the incidental music for plays. In the edition each of the revised scores of Nielsen’s more than 400 works has an introduction, relating the background and reception of the work in question in Nielsens’ life time, and the music text itself is based on all the musical sources, letters and other manuscripts which are available. All editorial emendations and considerations are meticulously documented in the Critical Commentary of each work. 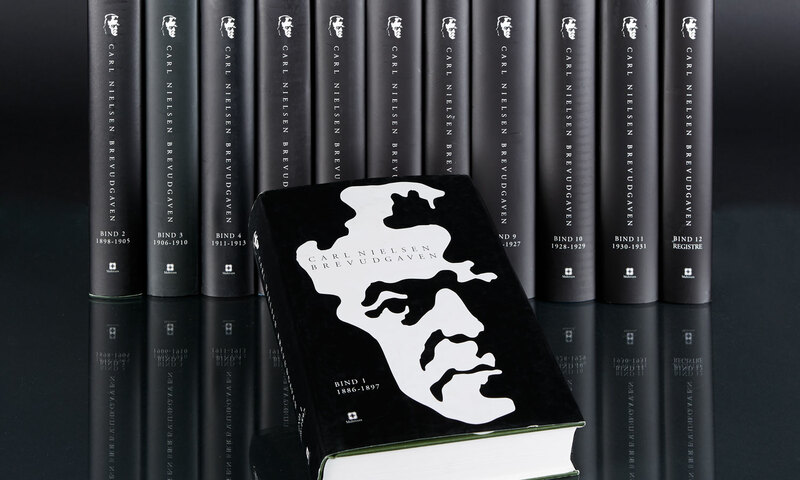 The Carl Nielsen Edition now makes it possible to study and perform every work by Nielsen, and, together with the other comprehensive bibliographic Nielsen projects of the previous 10-15 years, it opens up for a revaluation of his artistic development and his position in Danish and international music history. At the same time the edition has been one of the important sources behind the recently launched thematic/bibliographic catalogue, Carl Nielsen’s Works, CNW, which is available on line. The Carl Nielsen Letter Edition is a scholarly, annotated edition of all preserved letters of Carl Nielsen and his wife, the sculptress Anne Marie Carl-Nielsen, his diaries and calendar notes, and his correspondence with others such as Nordic and European composers, musicians, and others within the field of culture, together with his family and friends. The Edition comprises c. 3.600 letters by Carl Nielsen, c. 400 by Anne-Marie Carl-Nielsen, and 2.000 originating from family and others from Denmark and abroad, in all c. 6.000 letters from the years between 1886 and 1931. Shortly after the death of Carl Nielsen in 1931 some of his closest friends took the initiative to establish a Carl Nielsen Archive at the Royal Library, which has been the starting point for the work with and the search for new material for the edition of his correspondence. The work with The Letter Edition began in January 2002, and volume one was published on the 140th anniversary of the composer, on the 9th of June 2005. The editorial work was finished in October 2014. The Edition comprises 11 volumes of text and an index volume, altogether more than 7.000 pages. Volume 11 and the index volume will be published in January 2015. The Carl Nielsen Letter Edition makes it possible to study the life and work of Carl Nielsen, his musical oeuvre and its background, based on a massive range of source material, illuminating an important period in Danish cultural history. It is, too, a very fascinating and even dramatic account of the life and art of the composer. The Edition has been hosted by The Royal Library, the National Library of Denmark, and edited by the author John Fellow with several editorial assistants, from volume 6 the historian Gert Posselt. The project has been organized by the Royal Library and financially supported by a number of foundations and the Danish Ministry of Culture. In 2015 the Danish recording label Dacapo Records will be releasing a series of CDs that present new interpretations of Carl Nielsen’s music recorded by leading artists in optimum sound quality. An independent milestone is The Nielsen Project with the New York Philharmonic and its Music Director Alan Gilbert, which with its dual impact as both a CD and a concert series has given Carl Nielsen’s music a resounding American and international breakthrough. At the beginning of the anniversary year Dacapo is set to release the last two recordings in the series, which as a whole will comprise four individual CDs, and in the anniversary month of June the collected symphonies and concertos will appear in a CD box. In the spring of 2015 Dacapo also presents a special labour of love with the first complete CD recording of the millennium of Nielsen’s opera Maskarade with the Danish National Symphony Orchestra under the baton of the Nielsen expert Michael Schønwandt. Two weeks of intensive, high-spirited recording work in the DR Concert Hall have resulted in a new, fresh version of Nielsen’s beloved opera with well-known Maskarade voices of the Royal Danish Theatre such as Stephen Milling, Johan Reuter and Anne Margrethe Dahl, flanked by new colleagues such as Dénise Beck and Ditte Højgaard. Among Dacapo Records’ other releases in the anniversary year we can mention a collection of Nielsen’s well-loved popular songs as we Danes know them from the national songbook Højskolesangbogen. It is Ars Nova Copenhagen under the leadership of the conductor Michael Bojesen who have selected and recorded the songs, which are sung in four parts a cappella and include Den danske sang er en ung, blond pige, Påskeblomst and Nu lyser løv i lunde. On the sacred music side the organist and professor Bine Bryndorf has followed in Nielsen’s footsteps with a recording of the composer’s collected organ works on the recently restored organ in Copenhagen’s Nikolaj Church, for which Nielsen’s grand organ work Commotio was written. At the end of the year we present yet another couple of Nielsen recordings by among others the Danish National Vocal Ensemble and the Danish National Girls’ Choir. In 2015 Dacapo will of course make an extra effort to market the outstanding Danish Nielsen recordings that we already have in the catalogue, with artists like The Danish String Quartet, the Danish National (DR) ensembles, Thomas Dausgaard, DiamantEnsemblet, Inger Dam-Jensen – and many others. P2 has produced two exclusive podcast series about Carl Nielsen’s most significant contribution to Danish music: the symphonies and the songs. Performances of Carl Nielsen’s music by the Danish National Symphony Orchestra and a number of other Danish orchestras and ensembles will be sent live or at a later time as part of DR’s programme series P2 Koncerten, sent daily from 19.20–22.00. Broadcasts will include the Carl Nielsen Gala Concert on 9 June and a guest performance by the Vienna Philharmonic on 11 June, both events to be held at DR Koncerthuset in Copenhagen. Additional broadcasts will present a variety of international concerts of Carl Nielsen’s music, including the Gewandhaus Orchestra and the MDR Symphony Orchestra from Leipzig, as well as the leading symphony orchestras from Munich and Berlin. In September, P2 will air directly from Musikfest Berlin, where Nielsen is one of the featured names. Finally, P2 will also cover the Carl Nielsen International Chamber Music Competition 12–18 October. Saul and David 16 May. Broadcast of the Royal Theatre’s latest production. Masquerade 17 May. New CD recording featuring leading Danish artists with the Danish National Symphony Orchestra led by Michael Schønwandt. Prior to each opera broadcast, DR presents background information on these works, such as Carl Nielsen’s role as a vocal composer, his relationship with the Royal Theatre, coverage of rehearsals, etc. The European Broadcasting Union (EBU) exchanges more than 4 000 concert recordings of classical music every year, reaching across national borders in Europe, the US and Australia. Danish listeners will among other things be familiar with the popular Saturday opera broadcasts from major opera houses such as the MET in New York, Covent Garden in London, La Scala in Milan, etc. Each year, the EBU devotes special attention to a number of different themes and concert series, and will focus on two Nordic composers in 2015: Jean Sibelius and Carl Nielsen. Bent Grønholdt, music editor for Danish Radio’s P2, has put together a programme package for Europe featuring recent concert recordings of Carl Nielsen’s most important works. This includes all the symphonies with the Danish National Symphony Orchestra and international star conductors such as Herbert Blomstedt, Osmo Vänskä and Fabio Luisi, as well as the three solo concertos for flute, violin and clarinet, respectively. Soloists will be Sébastien Jacot (winner of the Carl Nielsen flute competition in Odense, 2014) together with the Odense Symphony Orchestra, violinist Nikolaj Znaider, and clarinettist Olli Leppäniemi. On the opera front, European audiences will be offered broadcasts of Saul and David with the Royal Danish Theatre, and Masquerade in the new CD version by the Danish National Symphony Orchestra. In the field of chamber music, The Danish String Quartet and the winning ensembles of The Carl Nielsen International Chamber Music Competition 2015 will be heard throughout Europe, presenting all the string quartets and the famous Wind Quintet. Finally, all of Europe and the US are invited to join the anniversary concert at Copenhagen Concert Hall on 9 June, the very day of Nielsen’s birth. The concert will be broadcast live. Based on the audience statistics for classical music throughout Europe, it is realistic to expect that many of the concerts with Carl Nielsen’s music will be heard by anywhere between two and four million listeners. Conversely, the EBU collaboration also ensures that Danish listeners will be able to experience highlights from the many international celebrations held in connection with Carl Nielsen’s 150th birthday. This includes concert recordings from Berlin, Dresden, Stockholm, Munich, Vienna, Amsterdam and Paris, brought to Danish listeners by DR, the Danish Broadcasting Corporation.